A list of the top 15 mystery hardcover bestsellers for the week ending October 29th, 2010 has been posted on the Hidden Staircase Mystery Books website. Some shuffling among the top 10 with The Girl Who Kicked the Hornet's Nest by Stieg Larsson still at number one and last week's featured title, Worth Dying For by Lee Child, moving into the top 4. 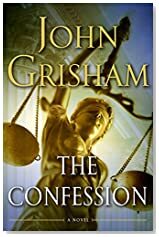 One new title debuts in position 15: The Confession by John Grisham.